I love pumpkin pie but I also like to find different types to make. Have you started to think about your Thanksgiving menu yet? Most people want a simple and traditional menu so you can not get too creative with dinner. You can get creative with dessert though. This pumpkin pie is wonderful. 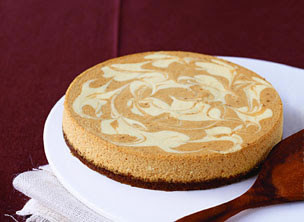 Pumpkin cheesecake is a perfect combination and the gingersnap and pecan crust is the perfect compliment. Preheat oven to 350 degrees F (175 degrees C). In a medium bowl, mix together the crushed gingersnap cookies, pecans, and butter. Press into the bottom, and about 1 inch up the sides of a 9 inch spring form pan. Bake crust 10 minutes in the preheated oven. Set aside to cool. I have totally been lagging on Entrecard lately, but when I hopped on yesterday I noticed you had made it up to the 3rd spot. I wanted to congratulate you on that. I was getting up to the top 20 when I was dropping 300/day, but I got burned out superfast. Anyway, I love your site!! I am making this in place of one of the pies I’ve been ordered to bring. Sounds very easy and delicious! Love the crust! YUM!! Thank you so much! Thanks for the recipe-it’s great! Pumpkin break with chocolate chips is another great one-check it out if you haven’t already! That should have read, “Pumpkin BREAD” not break! LOL at myself! Omigosh! This sounds fantastic! I definitely will include this in my holiday desserts! Thank you, thank you, thank you! That looks delicious and I can’t wait to try it thanks so much for a great dessert. That looks divine! I’m going to have to make this one! Hi. I never tried pumpkin cheesecake but it sounds delicious, specially with pecans. I´m writing down this recipe, thanks for sharing.